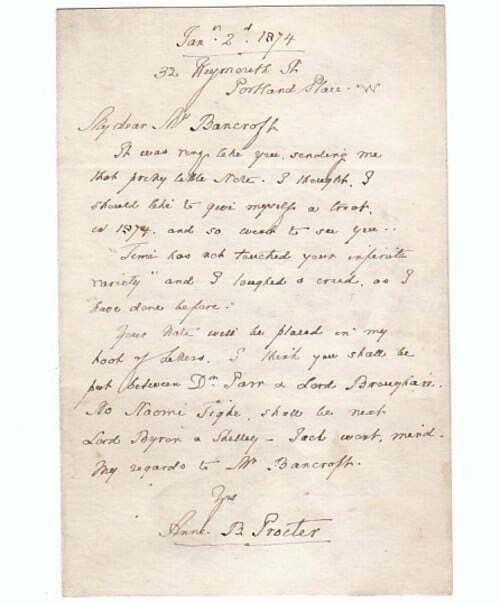 Autograph Letter Signed ‘Anne B.Proctor’, to Mrs.Bancroft, saying that she has placed her “pretty little note” in her letter book “between Dr.Parr & Lord Brougham”. 1 page 5 x 3½ inches, in good condition. 32 Weymouth Street, Portland Place, 2 January 1874. Anne Benson Procter [née Skepper] (1799-1888), writer who married the British poet, Bryan Procter (‘Barry Cornwall’). At their London houses. Procter’s sociable and talented wife’s ‘tremendous energy and genius for gossip made her a hostess of distinction’ (Letters and Private Papers of … Thackeray, 1.cliii), so that the Procters’ parties became a long-lived institution of literary London. As a widow, Anne Procter, with the assistance of Coventry Patmore, edited Procter’s An Autobiographical Fragment and Biographical Notes (1877). It was prefaced by verse tributes from Walter Savage Landorand Algernon Swinburne. The Procters’ daughter, Adelaide Anne Procter (1825-1864), was a successful poet.